This post is not about the iPhone. You might have heard that many people believe the latest innovation from Apple will not only revolutionize the mobile phone industry, but maybe even the future of mobile marketing. Whether it does or doesn’t, in the short term, it’s easy to forget that ideas for innovation may come from elsewhere. The Helio from Samsung is one of those kinds of products. The interface and look of the phone is not necessarily unique. Yet built into the phone are a range of smart features, from integrated support for MySpace Mobile, to full screen landscape video viewing. The feature that I found most interesting, however, was the built in GPS. 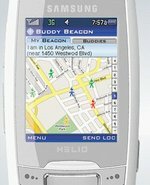 A core feature of this GPS service is something they have called the "Buddy Beacon" – a way of broadcasting your location to friends so you can find one another at any time. This idea of the beacon is a powerful concept with many other applications. Rather than most maps which rely on street addresses and turn by turn directions, the beacon can be a marker of location that offers a visual way for someone to find you … or find a location. It’s a portable homing device. What if retail stores could use this beacon concept for marketing? The idea of "Beaconvertising" simply refers to the idea of broadcasting your location to customers in a way that helps them find you in the real world. Now think about all the situations where as a consumer all you need is the closest location of something. The closest place to buy diapers – the closest place to rent a movie – the closest place to fix a flat tire … the list is endless. These are purchase decisions made largely based on location – yet there are still only rudimentary ways to get this information on mobile devices. I should also point out that Beaconvertising is not just for the future – Business 2.0 reports in this month’s issue about a few advertisers and campaigns, including an effort from Saturn to help customers locate their nearest dealership – that are finding ways to use Google Earth and MSN’s competing services to drive users to their physical locations. Jeff Goodby notes in the article that he believes "every retail chain will eventually do this." As GPS phones become more common – the range of uses will continue to grow as well. Keep your eye out for Beaconvertising through GPS – it just may become the next killer app (and opportunity for marketing) on the mobile phone. Take that, iPhone.